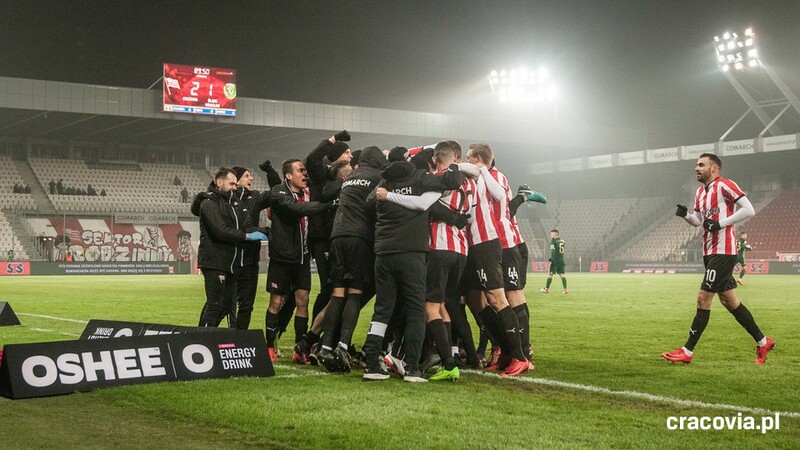 To start the year, Cracovia welcomed Śląsk Wrocław to an empty stadium, as a sanction for the fans’ misbehaviour against Wisła back in December. The Pasy had to learn how to play without fans. The game turned quite exciting and open, with a dominating home side creating several goal chances, even if the visitors opened the score on their first action of the game. After the break the Pasy kept on playing forward, unlucky to see all their attempts stopped by the visiting goalkeeper until Captain Covillo’s header finally found the nets 10 minutes into the second half. A great way to come back for the Bosnian captain following a severe head injury and a frustrating season start. And while Śląsk claimed a goal denied by Goal-Line Technology 20 minutes later, the Pasy pushed to the very last second to score an unhoped-for winner. Deniss Rakels, for his return, took advantage of a huge defensive mistake from Śląsk to seal the first win of the year to Cracovia. 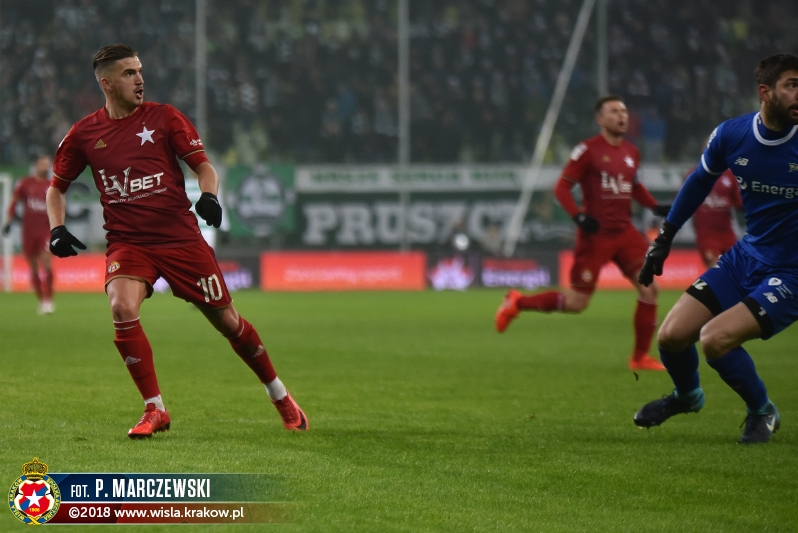 Wisła kicked off 2018 with a far journey to the seaside to face Lechia Gdańsk. The visitors did not waste time and opened the score at the 14′ via their Serial Scored Carlitos Lopez. The Spaniard managed a brilliant lob to beat the home goalkeeper, following a poor clearance, scoring his 16th of the season. An deal game start. However, the home side reacted quickly with several goal chances before equalizing 20 minutes later. The second half did not offer much besides one big goal chance for each side. The score remained thus 1-1 in a quite closed and offensively poor game. For Coach Carrillo’s first official game in charge, Carlitos’ wonder goal and the team good away result will probably be the only things remembered. A complicated trip to the far east awaited the Pasy, to face Coach Probierz’s former team and currently #2-ranked Jagiellonia Białystok. Cracovia held strong in a first half poor in goal chances but highly dominated by the local side. Jagiellonia maintained the same pressure and intensity after the break, to keep Cracovia choking. Their efforts were rewarded at the 60th with a superb individual action from Czech forward Pospíšil. The Pasy only managed to create one dangerous goal chance two minutes from the end, which shows how one-sided the game had been. The score does not reflect the game – Cracovia could simply not compete and has overal been dominated. Coach Probierz also chose a maybe too defensive tactics, which kept the team mainly defending. A lesson for the Pasy against one of the best playing teams in the league, with however, some positive elements to take on: the defensive performance, the collective fighting spirit and a great game from goalkeeper Peškovič. Wisła welcomed Arka Gdynia, the other team from the seaside, fighting to be in the Top 8 and ranked right behind Wisła. A team hungry for points, which they proved by opening the score after 10 minutes. The reaction was immediate, and who else than Carlitos Lopez to show the way, first with a goal disallowed for offside, followed by a free kick on the post. And it is right before the break that Wisła finally equalized thanks to Jesús Imaz wonder long distance shot. In the second half, Croatian defender Arsenic gave Wisła the lead, a bit lucky to be at the right spot. But another shaky positioning of the defence allowed the visitors to equalize shortly after. Wisła fans had to wait until the last minutes of the game to see Arsenic score his second of the evening and seal the win. While the team showed a great fighting spirit, the repeated defensive mistakes almost cost them points.